The Indiana Fever host an Annual Inspiring Women Night each season to showcase inspirational women in the community. The inspiring women are featured during a pregame event, and inspirational messages are played throughout the game. Fever representatives give inspirational pep talks and/or programing to inspire individuals to strive for greatness. Programing can include informing students of different careers in sports. In particular the Fever hold an event on National Girls & Women in Sports Day bringing in young ladies from area schools to learn about all the different areas within the sports industry they can strive for. Women from the Fever, Pacers, and Bankers Life Fieldhouse share information on their jobs and insights on how they got there. The WNBA, NBA, and G-League are committed to supporting our active and retired service men and women and their families around the world. Through the WNBA Hoops for Troops program, teams and current and former players honor military and their families through a variety of activation including in-arena nights, military base visits, ticket programs, in-game activation and meet & greets with Wounded Warriors. In an effort to be more environmentally conscious, the Fever and Republic Services continue to improve the environmental performance of our organizations as well as help spread the message to our fans. Go Green addresses environmental conservation policies within our offices and educates our fans with a Sustainability Night each season. The WNBA, its teams, and players celebration of inclusion and equality in support of the LGBT community. In partnership with Big Brothers Big Sisters of Central Indiana, the Indiana Fever provide young boys and girls with their adult mentors to attend Fever games throughout the season. Through this program, Fever Friends matches receive a special experience in the Fever Locker Room and can write letters to their favorite Fever players. Fever Friends began during the Fever inaugural season. This tournament benefits the Fever Cares Fund of the Pacers Foundation Inc. The Annual Indiana Fever Bowling Tournament presented by Gibson Teldata Inc is the premier fundraising event for the Fever Cares Fund of the Pacers Foundation Inc. The event has been hosted at Pinheads in Fishers. For more information on the Fever Cares Fund of the Pacers Foundation Inc., the Annual Indiana Fever Bowling Tournament and grants, visit PacersFoundation.org. To register a team for the bowling tournament click here. To make a donation to the Fever Cares Fund, contact Roberta Courtright at rcourtright@feverbasketball.com. As part of the Pacers Sports & Entertainment’s Service Initiative, the Indiana Pacers and Indiana Fever celebrate a “Season of Giving” during the year each with a variety of community outreach efforts throughout the month to give back to the community that has given so much to us. Season of Giving include events such as the “Come to Our House” Thanksgiving Dinner, Children’s Hospital Visits, Toy Give-a-way and Shop with a Pacer. In celebration of the NBA’s Season of Giving Campaign, the annual “Come to Our House” Thanksgiving Dinner presented by US Foods offers the opportunity for disadvantaged men, women & children to receive a home-cooked Thanksgiving Meal. In addition, participants also have the opportunity to interact with Pacers players & coaches and receive cold-weather items to help them cope with the cold Indiana winters. Members of the Indiana Pacers, including players, coaches and training staff, along with Fever players & coaches, Indiana Pacemates, Boomer, Freddy Fever, Pacers alumni and members of the local media are on hand to help serve dinner, mingle with the guests, and distribute goodie bags with cold-weather and personal hygiene items. Each year the Indiana Pacers and Indiana Fever partner with JAKKS Pacific to provide toys to deserving youth in Indiana. 50,000 toys are donated each year to a variety of community organizations and thousands of children with assistance provided by the Indiana National Guard and UPS. These toys are distributed during Holiday events in November and December. 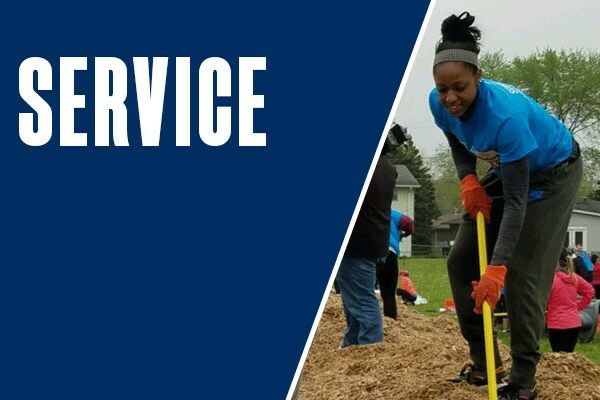 As part of our continuing community outreach efforts, the staff of Pacers Sports & Entertainment participates in a community service project on a quarterly basis. The goal of the program is to emphasize one of PS&E’s Core Purposes — Serving Community — by organizing four days per year where we can “Reach Out Together” as a company. This program builds upon the work of our Community Relations Department and Pacers Foundation and allows our employees to contribute in a real and consistent way to our community. As part of the Kroger Ball Exchange, 12 children are presented a basketball autographed by an Indiana Fever player during the pre-game player introductions. In addition, each child receives a Kroger Ball Exchange t-shirt. To sign your group up to participate in the Kroger Ball Exchange, please call (317) 917-2500 and ask to speak to a Group Events Specialist. At select games throughout the Fever season two Fever players sign autographs for fans in the Fever/Pacers Team Store after the game. Fans must have passes to enter the line and receive one autograph per player per pass. To sign your group up for a Fever postgame autograph session, please call (317) 917-2500 and ask to speak to a Group Events Specialist. The WNBA connects with fans of all ages through extensive community outreach. Every month of the WNBA season, the WNBA chooses one player from across the league to receive the WNBA Cares Community Assist Award. The award honors the WNBA player who best reflects the passion that the league and its players have for giving back to their communities. Indiana is fortunate to have and have had a number of outstanding female role models on the Fever roster that make unbelievable efforts to give back to the fans and the community. The Fever has consistently had players win the Community Assist Awards. For more information on how a member of the Indiana Fever team or coaching staff can make an appearance for you, please click here. For more information on the WNBA Community Assist Awards, click here. The Dawn Staley Leadership Award was created to honor the WNBA Player who best exemplifies the characteristics of a leader in the community in which she works or lives. The award will reflect Dawn Staley’s contagious leadership, spirit, charitable efforts and love for the game. The WNBA will select one (1) player each year from across the league for the Dawn Staley Community Leadership Award and will donate $10,000 in the name of that player to the charity of her choice. All WNBA teams will be asked to nominate a player for the WNBA Dawn Staley Community Leadership Award, which will be awarded at the start of the following season. Tamika Catchings won the inaugural Dawn Staley Community Leadership Award in 2007 and again in 2015 for her work around Indiana and with her own Catch the Stars Foundation. For more information on the Dawn Staley Leadership Award, click here. Request must be submitted online via our online donation request form. All requests must be received at least six weeks prior to the scheduled event date. Organization must be within the state of Indiana. The organization must be a charitable, 501(c)3 organization. Organizations are limited to one request within a 12-month period and are considered on a first-come, first-serve basis. We do not donate to third parties fundraising on behalf of another organization. Each year the Indiana Fever receive thousands of requests to support worthwhile charitable causes. While we make every effort to accommodate as many of those requests as possible, we are simply unable to fulfill them all based on the volume we receive. In order for your organization to be considered for a donation item for an upcoming charitable event, you must comply with these guidelines. Please note we are no longer accepting faxed, email or written requests for donations. This online donation request system has been implemented to decrease our carbon footprint and to help protect our environment. We appreciate your support with our procedures and policies. Kids love going to a professional sports event. For many of our kids, at risk or not, they might never get a chance to see the Fever in action. A night out with a chaperone and a group of friends lets them see on-court athletic achievement. And it might just turn out to be instructive about the benefits of determination and perseverance. All we know is that the kids have fun and laugh and let us into their lives for a night. And for us, that’s a good start. Our Pacers Foundation Inc. Fever Cares Fund Ticket Program is open to all non-profit organizations in the state of Indiana and is provided through the generous contributions of our players and corporate community. For more information, visit Frequently Asked Questions.